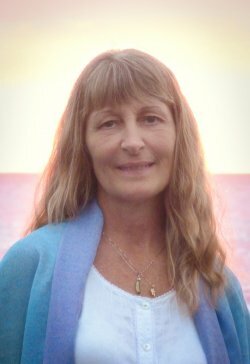 Darlene is one of approximately 200 worldwide certified teachers of the School of Remembering® who has been entrusted to teach the 'Awakening the Illuminated Heart'® workshop/meditations. She was selected and trained by Drunvalo Melchizedek and the School of Remembering®. She is deeply honored and grateful for being given the unique opportunity to be of service to humanity through sharing these sacred teachings during this time of great transformation into higher consciousness. The ATIH workshop is the culmination of Drunvalo's life work and includes his newest teachings. These ancient and sacred teachings are now being given to assist all of Humanity in our ascension process into higher levels of consciousness. Darlene was first introduced to Drunvalo's work in 1997, while attending the Virginia School of Massage. In 1999-2000 she was led to his Flower of Life books and the study of sacred geometry. From there, she later came to Drunvalo's 'Living in the Heart' teachings. Since Darlene has been a practicing RN in the health and healing field for many years, Drunvalo's 'Living in the Heart' teachings resonated deeply with her and her work as both a nurse and a massage therapist. Since 1993, Darlene has also extensively studied the teachings of a Master from India, Paramahansa Yogananda. She has been practicing Kriya Yoga meditation since 1995, as was originally taught & passed down through a lineage of spiritual avatars from Mahavatar Babaji to Paramahansa Yogananda. Swami Sri Yukteswar, the spiritual teacher of Paramahansa Yogananda, gave the 'Unity Breath meditation' to Drunvalo for the ATIH teachings. The 'Tiny space of the Heart', from where we can truly create our reality in this most sacred place of 'Love & Unity' (which is also taught in the ATIH workshop), was long ago written about in the Upanishads. Darlene makes her home on the beautiful island of Maui in Hawaii. She enjoys kayaking in the crystal blue waters of Hawaii ... and she loves to swim with dolphins. She also enjoys teaching ICU (Inspiring Children Universally) classes to children, a program wherein children can learn to 'see', read, play games, etc, without the use of their physical eyes. The ICU program helps children to empower themselves to return to the light within. She has been successfully teaching 'Awakening The Illuminated Heart' workshops locally throughout the Hawaiian Islands, as well as the mainland US, Canada, India, Indonesia, and Malaysia. She is delighted to travel wherever she is invited in the world to be of service to humanity and these sacred teachings. So if you are ready to begin this sacred journey into your heart, and to receive the 'inner tools' that are needed for ascension, it is her privilege, honor and greatest joy to assist you during this time of transition into higher consciousness. "Darlene, I am so blessed to have attended your ATIH workshop. "Darlene, thank-you for loving me - it feels so good ! This was an amazing experience and the unique experience. Love you universe love you Darlene. Excellent course, one who wants to change his/her life by changing the way of thinking should attend this course. Darlene Waddell gave us all that she had. The workshop was wonderful, the teachers were really committed and awesome.The range of topics and exercises covered were kind of intense for four days and needed more practice after the workshop, to create long term benefit for us, and for which I would have liked to be given a manual or some take away of the exercises, the meditation words that they spoke when we were under the blind fold, and may be a workshop audio CD for us to follow for our daily home practice. Although we took notes there were many activities that we just went to the experience of doing and with so much packed into the four days, its not possible to remember all the exercises in detail and accuracy. The fees although by US standards it was not a lot of money, could be optimized a bit more. It has been a life changing experience and would love to be able to carry forward and offer and teach to many more. But I see the teacher program has been discontinued. The Indian continent and our neighboring countries are under served and it would be great if we could have a regular centre here in India.